You'll need an HTC Vive. 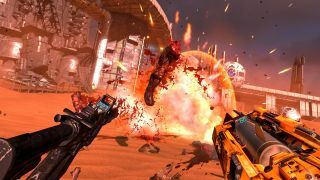 Serious Sam VR: The Last Hope is coming to Steam Early Access on October 17, developer Croteam has announced. They expect it to be in early access for around six months, with the full version boasting more enemies, planets, weapons and bosses, along with a skill tree and other bits and bobs. You'll need an HTC Vive to play it, and by the looks of it you'll also need a strong stomach: just look at all the things that will be exploding into gory bits before your virtual eyes.